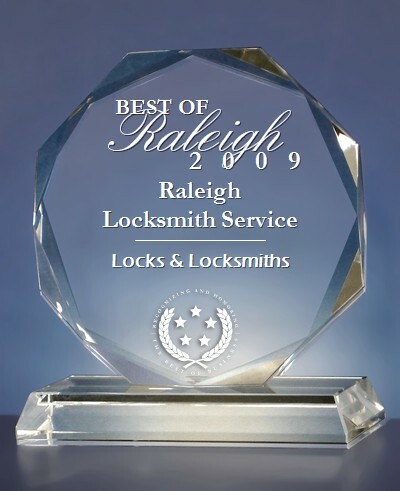 Since 1981, Raleigh Locksmith has developed an outstanding reputation in the Raleigh/RTP business community. With a desire to maintain the highest level of customer service and satisfaction, Owner Ed Walters, has chosen to maintain this as a family business. Customers will quickly tell you that you can count on Ed, and his son Kevin, to ALWAYS solve your security problems, be on time for appointments, and to treat you with honesty and integrity. These guiding principles have allowed Raleigh Locksmith Service to grow through the decades with thousands of repeat customers. You will speak directly with Ed or Kevin when you call and will be served by one, or both of them, when you hire Raleigh Locksmith. Ed’s credentials include a Bachelor of Science in Business Administration from East Carolina University (1981), locksmith certification from the Belsaw Institute, and North Carolina locksmith licensure. He and the business are also fully insured. Ed’s son, Kevin, started working as a locksmith apprentice during summers and school holidays in 2001 and joined the business as a full-time locksmith during the summer of 2010 following his graduation from East Carolina University where he received his Bachelor of Science in Construction Management with a minor in Business Administration. Soon thereafter, he took the NC Locksmith Licensing exam and became a fully licensed locksmith. One of their recent customers said it best, “You will find that Ed’s and Kevin’s knowledge, skill, and professionalism, combined with their winning personalities, make them the very best choice when you need a locksmith in the Raleigh, NC area!” Angie’s List customers, as well as locksmith review websites, consistently sing praises for Raleigh Locksmith, too. For fast, friendly, professional locksmith service, call Eddie and Kevin today! Serving Raleigh/Wake County and the Research Triangle area of North Carolina since 1981! Can you name everyone who currently has a key to your home? If your answer is "no," your safety may be at risk, and you may need your home rekeyed. Give us a call today!